Well, the Copper River in Alaska is running strong, and I've been lucky enough to fall into a bit of its wild salmon recently. Truly one of the North's spring treats. Makes me wish I was a bear. Tasted raw, the flavor made me think of spring peas, so fresh and almost green; a small little chunk, grilled hot and quickly so that it remains nice and rare was absolutely perfect with some grilled asparagus--a true spring/summer/whatever this season is dish. The cleanest and purest of flavors. Just look at the definition of colors, textures and flavors in the fatty piece taken from the belly in the photo above. I took a good chunk from the mid-section of the fillet and put it into a simple cure of salt, brown sugar, fennel seeds and lemon zest; that may make an appearance at Thursday and Friday's Salon; sliced nice and thin, this gravlax would last for a few weeks, though I doubt it will make it past Friday. In other news, looking for inspiration for Sunday's Southern Staples Salon (and overlooking my sorrow of missing a crew of Southern friends' Memorial Day Feast yesterday), I need not look further than my memories of places like Carver's and the now closed Son's Place in Atlanta: Fried Chicken, Collard Greens, Black Eyed Peas, Mac and Cheese, Peach Cobbler, Okra, Hoe Cakes and Sweet Tea...the challenge here will be paring this down into something reasonable for the folks on Sunday! Looking forward to it! So! I was able to score some great bunches of veggies before all of the farmers packed it in early at Green City yesterday. I was down there by about 9:30, kind of late but hey--it was Wednesday (vs. the mayhem of the Saturday market) and pouring rain so I wagered that the crowds would be bundled up inside, not willing to brave the rain. That bet went a bit too far as most of the farmers were headed out as well just as I arrived, not just to get out of the elements but to tend to things back home--I even heard talk of a tornado hitting near one of the farms. Gladly for me (and tonight's Vegetarian Saloneers), Green Acres and Mick Klug Farms were toughing it out in the mud pit that was Lincoln Park, and I was able to get a few things, supplemented later in the day by that great little indoor farmer's market, the Green Grocer. Thus, we've got some good lookin' food on the menu for tonight. Meanwhile, coming back in, soaked through from the rough weather, I needed a serious dose of comfort. I had a bit of ground beef and pork left over from a burger party with Old Crazy Hair and his crew the night before, so I sauteed that up with some garlic and chile flake, added some red wine and crushed tomatoes, and made the quickest, easiest bolognese sauce of all time and tossed it with a mish-mosh of dried pasta--spaghetti and bucatini. As much as I love fresh pasta, this is why I keep dried pasta around. Showered with parmesan cheese, this is the quick pasta dish we turn to for some of that rich comfort. With leftover epi bread on the side, I was all set to continue my venture. In other news, due to popular demand, we've added another "Spring, Where Are You?" Salon on Friday, June 3, and we have one seat open for the Salon of the same name and theme the night before on Thursday, June 2, as well as seats available towards the end of June for the Beer Food Salon on Saturday June 18 and the second Seafood Salon on Wednesday, June 22. Hope to see you soon! Saturday’s Bistro Salon found six new folks on the doorstep of the F.o.t.D. headquarters (one of whom admitted that he had no idea what he was coming to, and only realized it wasn't a restaurant as he entered the space! ), ready to cook and eat and drink some wine. I'd spent the morning at the Green City Farmer's Market checking the ever increasing amount of goods (though it seems like this is really the first week the weather is beginning to cooperate), then down at Peoria Packing looking for the right steaks, of which I found none, so over to Paulina Market I went, which is really where I should have gone in the first place. Don't get me wrong, good things can be had at Peoria Packing, but man oh man is it packed on Saturday, and the meat is cut in such volume that the level of love and care just isn't there like it is at Paulina. At Paulina, I was able to score the Flat Iron steaks I'd been coveting, of top-notch quality, perfect for the Steak Frites we'd be making. Lemon sabayon tart with a pine nut crust, cream and rhubarb compote. My farmer friend had some great rhubarb, so we just cooked it down a bit with some lemon juice and sugar. Nothing else. On top of the tart it went, which had a crust of pine nuts, sugar, flour, butter and egg; the sabayon was simply eggs, sugar and lemon juice whisked over a double boiler. Somehow light and decadent at once. And we devoured that thing. The wine flowed as did conversation; it was a lively night to cap off an absolutely gorgeous day. The Bistro Salon is definitely coming back soon, without question. I'd like to thank the bistros--not only of France but here in North America as well--where I've drawn inspiration for this and so many other meals, and for the superb book Bouchon by the untouchable Thomas Keller for some really solid inspiration. And of course, my six great Saloneers. Until next time, bon appetit! From the Depths of The Fridge, or, Let's Keep This Going! Thanks for all the great support of the Food on the Dole Salons, everybody! Seats are filling up fast and it looks like we'll have a busy June on our hands, full of tasty food and good folks around the table. We still have a few spots open, though, so be sure to grab yours soon here. Right now, we're gearing up for the Bistro Salon tomorrow night--I'm thinking mussels marinières, steak frites and the beloved rillettes, with a couple of spring market items to lighten things up a bit as the red wine flows. So, I'm off to shop; better eat something first. Kicking around the fridge I found some roasted beets, green garlic hummus, roasted chicken, green garlic pesto, whole grain mustard and some really good grainy bread. Three pieces of bread got the F.o.t.D. one-side toast (the crisp, toasted side goes on the inside of the sandwich, providing crunch while leaving the outside nice and soft) and everything was piled up with a dose of sriracha for good measure. Oh! And there's a pickle! Perfect. I'll see 6 of you tomorrow at the Salon and perhaps some of you at the market in the morning! June Salon Dates Are Here, and a New Logo! Spring, Where Are You? It's nearly June, and we're wondering where spring is! Luckily, the farmers have been working their hardest to bring great things out of the soil in these parts, so this weeknight Salon will feature a bevy of top-notch produce from the farms in the area. Please note: this is not a vegetarian Salon. Come join us as we create from fresh goodies picked up at the market by yours truly the day before. 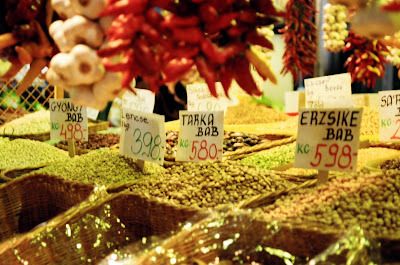 No menu will be set until the goods are in hand, so be ready for some deliciously spontaneous cooking and eating! BYOB, $40. Southern Staples During my time in Atlanta, I ate some of the most memorable food of my life. Southern food has a certain soul to it, and we'll be recreating some of that here at this Sunday Salon, so come join us as we celebrate the simplicity of one of the truest cuisines we can call our own. This one'll be hearty--greens, casseroles, and we'll most definitely break out the cast iron for some fried chicken. BYOB as always, so bring some moonshine to put in that sweet tea! $40. Pizzaland Stop by the Pizzaland Salon and throw some dough! F.o.t.D. wants you to learn how simple it is to leave the pizza guy out in the cold and build top-notch pies from scratch. We'll put together a ton of great homemade toppings and bake pizza after pizza in this casual weeknight salon. BYOB as always, so bring some cold brews or that wicker basket wine! $30. Brunch II The first Food on the Dole Brunch Salon was so successful we've just gotta do it again! Like before, we'll visit old classics, and possibly brave some new terrain in our market-driven menu; a perfect way to resurface from the weekend's debauchery. BYOB of course, and I'll throw in a mimosa as well! $40. Farmer's Market Salon The summer brings us an ever growing bounty of gorgeous produce at the markets, and that fills us with inspiration when cooking! Come add to the spontaneity at this weeknight Market Salon, where we will create a delicious meal from produce picked up by F.o.t.D. that morning from the Green City Market. Anything goes, and please note that this is not a vegetarian Salon. BYOB as always, $40. Beer Food Salon Join us in this rollicking BYOB Salon as we kick back and make some simple, completely from scratch food to go along with your beer. We'll make some mussels, frites and aioli, grill some sausages, and who knows what else? Bring whatever style beer you like--this food goes well with anything from the lightest swill to the heartiest Belgian! Teetotalers not allowed! $50. Seafood Salon II The first Seafood Salon was a great success, so let's do it again! We'll lock down the freshest available seafood and complement it beautifully with what the markets have available. This time around I'm thinking about the beautiful trout available from Idaho and Wisconsin, and you know it wouldn't be a Salon without some oysters! BYOB as always--crisp white wine, anyone? $60. Vegetarian Salon II Consistent readers of Food on the Dole know that I am a boisterous carnivore. Despite that, I absolutely love creating fulfilling meals without using meat, and have always found this to be one of the more rewarding challenges as a chef. So, let's explore the late June options that are coming from the local farms and celebrate the beauty of vegetables for what they are, as opposed to finding ways of making them emulate meat--you won't find any seitan or tempeh at this Salon! 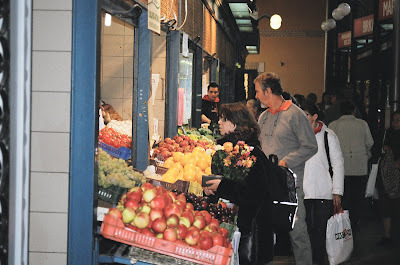 It'll be highly market-driven; based on what I find at the farmer's market, we'll prepare a full and delicious meal. The Salon is BYOB, so please bring whatever you'd like to drink! $40. An enormous thank you to all the support we've gotten so far--from saloneers to advice givers to the lovely and talented Kristen Jones who does all of my artwork including the perfectly stunning new logo above to the markets to the press and beyond--I look forward to meeting many more of you and connecting over some great food! Hasta la Pasta, and New Salon Dates Soon! -Thick, fat tagliatelle was hand cut and we tossed it in a pork ragout made from braised pork, onions, green garlic, artichokes and tomatoes. Cooked long, low and slow, the pork was meltingly tender and was punctuated by the artichokes and brightness of fresh parsley, chives, orange zest and olive oil. -A little dessert bite was offered up a la minute: greek yogurt with shaved tangelo granita and local honey--a small little cap to a big, hearty meal. This was a great Salon--everyone got involved, and we even had little assembly lines down for rolling pasta, cutting it, and forming the beautiful tortellini. We exchanged ideas and stories about food, and someone even went home with one of my kombucha scobys. It was a real nice ride through a Sunday afternoon, and a bit restorative after the monster two weeks we've just had at Food on the Dole. A big thanks to Sunday's crew, and stay tuned for June Salon dates this week! Whew. It's amazing the energy it takes to run a restaurant. Even more amazing is the energy it takes to run a restaurant at the same time as putting out 3 highly creative underground dinners. Add to that an absolute lack of sleep and, well, let's just say we're all very lucky no one lost their mind last week. 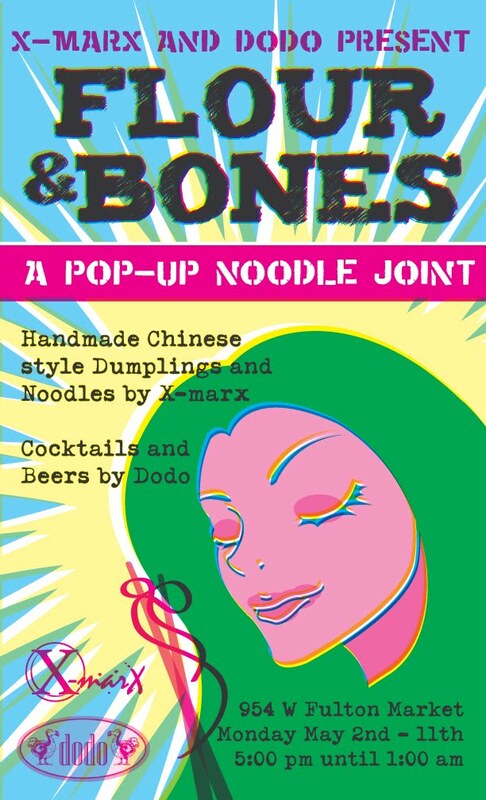 For the past ten days, the Xmarx crew put out Chinese noodles and dumplings of the highest order--based upon extensive culinary research deep in the heart of Chengdu--under the guise of Flour and Bones. The food was solidly amazing, honest and nurturing, and on top of it all, they put out 3 of their deliciously inventive underground dinners on 3 of those nights. I only worked 4 of Flour and Bones' ten days, rolling noodles, making dumplings, expediting the line and contributing wherever I could to those 3 dinners, and I am absolutely beat. I only worked 10am-1am most of those days, and sure, that's a 15 hour day, but the rest of the crew was at it pretty much non-stop, basically only napping here and there when time (and mental state--you'd be amazed at how difficult it is to sleep in this state) allowed it. This is what happens in so many restaurants all over the world, and it is at once evidence of a certain level of insanity, and of great passion; unhealthy yet so creatively fulfilling it's no wonder that those who get it do it. From the dishwashers in the back of the house to the line cooks to the top guy, these people are driven if crazy, focused though chaotic and the good ones, well, they have a way of squeezing the most delicate, balanced flavor out of what appears to be sack of stones and fish guts. I'd just like to pay tribute to these people--the ones who don't have book deals, the ones who don't have tv shows, the ones who don't have shiny new restaurants greased by the oil of celebrity. So, as I raise a shot of Jameson and an Old Style tall boy, here's to the chefs, cooks and kitchen crews that have each others' backs no matter what--those who grind it out everyday. I had the good fortune of being able to visit Budapest recently, and let me say, it was a beautiful trip--and the city itself one I wouldn't mind calling home for awhile. It's a gorgeous, bustling metropolis of two sides--Buda and Pest-- split by the beautiful blue Danube, full of intricate architecture, art and spas; bustling nightlife and aromatic bakeries. 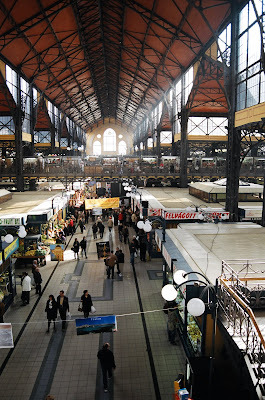 But most importantly, it's home to one of the great markets I've been able to experience (with Cleveland's--yes, Cleveland's--West Side Market ranking up there as well). Budapest's Great Market Hall is huge and full of everything one would need, all under one roof. But not in a Costco (ugh, did that word really just appear in the Dole?) kind of way; this has beautifully crafted sausages, fresh meats and cheeses made by skilled craftsmen and women alongside the freshest produce; baked goods and the morning's milk; heaps of spices and beans and, importantly to a guy like me, a kiosk on the mezzanine overlooking the entire thing serving sausages, buttery pastries, coffee and beer. 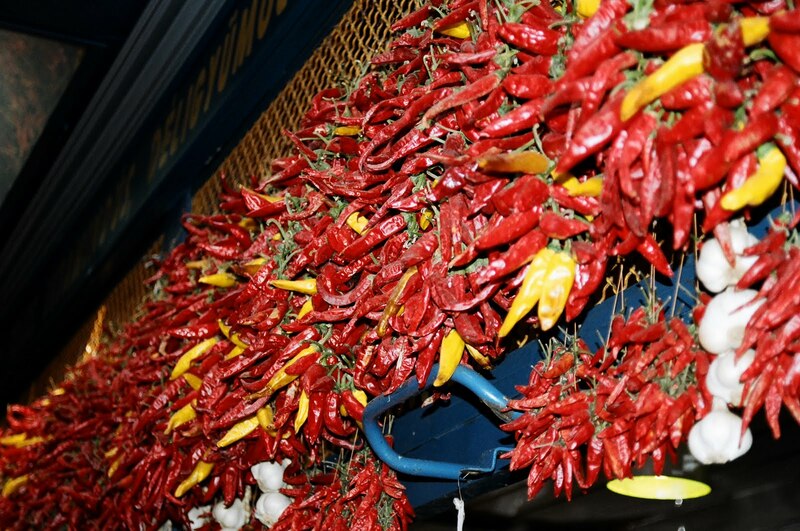 And for the tourists, they've got big ropes of garlic and paprika to smuggle back with a bottle of tokaji. What did I do? Naturally, I hit those sausage kiosks and drank a beer as a mid-roam break. Espresso for the road to continue my exploration of this wonderful market and wonderful city. A long soak in one of those spas at the end of the day, and huge meals and drinks to begin the night, on one of which I met a one-armed trumpet player in a smoky bar over some absinthe. Yeah...I need to get back to Budapest, and soon. We had a lovely little Brunch Salon here on Sunday, with 6 folks joining me at the F.o.t.D. headquarters to cook and eat with each other. I greeted them with some coffee from a friend's roasterie (which, in my opinion, is the best around) and a bloody mary using vodka I'd soaked cucumbers in, bringing a nice freshness to the drink. For the garnish, I pickled some stems of those great ramps my friend brought me in some red wine vinegar, cane vinegar, coriander, mustard seed, ajowan, salt and sugar and added them to a colorful skewer of yellow pepper, Persian cucumbers and piquillo peppers. Then we got to work. Homemade English muffins. The night before the Salon, I made a rather moist dough using the starter I got from old crazy hair and let it rise overnight. Then, the Saloneers shaped it into rounds, let it rise again, and we griddled them, giving them that distinct English muffin char and shape. Sauteed ramps. Oniony and representing everything good about Spring. Hollandaise sauce. A quick step by step demo was given on making this rich sauce, loved by many, made by few. Easy, wasn't it guys? The F.o.t.D. Ramp and Double Smoked Pork Loin Benedict. We warmed and sliced a smoky loin I picked up at Gene's, and the Saloneers learned how to poach eggs properly. I've gotta say, they did a pretty good job, too. Nice and creamy yolks. We sliced the English muffins in half, griddled them again and topped them with the sliced loin, poached eggs, ramps and Hollandaise sauce. Homey Fried Potatoes. Chunks of potatoes cooked with red and yellow pepper, jalapeno, onion, garlic and plenty of lard. ...and we rounded things out with a platter of sliced pineapple, blackberries and the mysterious supreme of orange. All in all, it was a great late morning/early afternoon, with some terrific participants who learned some technique and created a tasty meal. A big thanks to those who came to the Brunch Salon, and we're looking forward to the next one: Pasta! 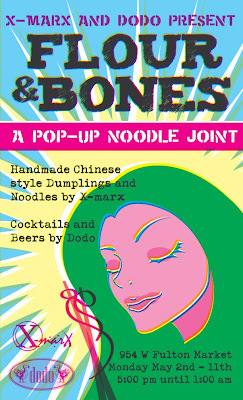 Starting today, I'll be joining old crazy hair down at X-marx' 10-day-only noodle house, Flour and Bones, down at Dodo at 954 West Fulton Market. For those of you getting blocked out of Next and Aviary, we'll be directly across the street cooking up a simple but way-out tasty menu of housemade noodles, dumplings and pickled sides fully pushing the circle of deliciousness. Beer and cocktails available, kitchen opens at 5pm, and no reservations (or tickets) required. Through May 11. They fed me late last night, and I gotta say, it's something special; F.o.t.D. fans, come say hi! Needless to say I'm going to be a bit occupied over the next week or so, but I promise to report on the lovely Sunday Brunch Salon we had here at the Food on the Dole headquarters. Now--I've got to slurp down this scone the Sunday Brunch Saloneer crew made and beat a path down to Fulton Market. See you all down there! I found myself with a good bit of smoked pork belly while planning yesterday's Brunch Salon (more on that soon) and, having had sandwich on the brain for a while, sliced it thick and threw it in the trusty cast iron with some sliced onions to make that great British bacon sandwich sometimes referred to as a butty. When nice and seared, I took the belly and the soft, sweet onions out, and slapped in a couple pieces of that great miche bread from Bennison's in Evanston to fry up in the remaining fat in the pan. I like to toast/fry only one side of the bread, and put this fried part on the inside of the sandwich--keeping the outside soft while still offering that great crunch of fried bread. Keeps it a bit neater as well, though with this edition of sandwich I subbed whole grain mustard for the butty's usual butter and, as you can probably tell from the picture above (Click on it. Get closer. ), it became a delicious mess pretty quickly. But as you can imagine, that is scarcely a problem at the Dole headquarters.